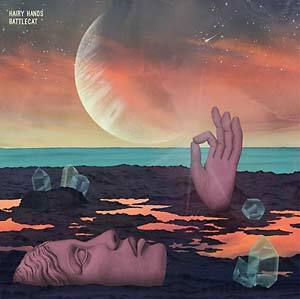 Hairy Hands presents Battlecat EP, a record based on an imaginary cat. From space. Created alongside a short comic book about Battlecat, inspired by the sci-fi drawings of EP sleeve artist Essy May and "my girlfriend's parents' vinyl collection... the original War of the Worlds record and... the RZA movie The Man With the Iron Fists which had some great martial arts cat-like men." Played with Kwake Bass (DOOM, Kate Tempest) and Andy Ramsay (Stereolab) on drums, Jack Wylie (Portico) on saxophone, and Mark Rainbow (Laurel Collective) on keys and synthesizers. 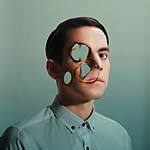 Mastered by Brainfeeder beatmaker and Leaving Records founder MatthewDavid.